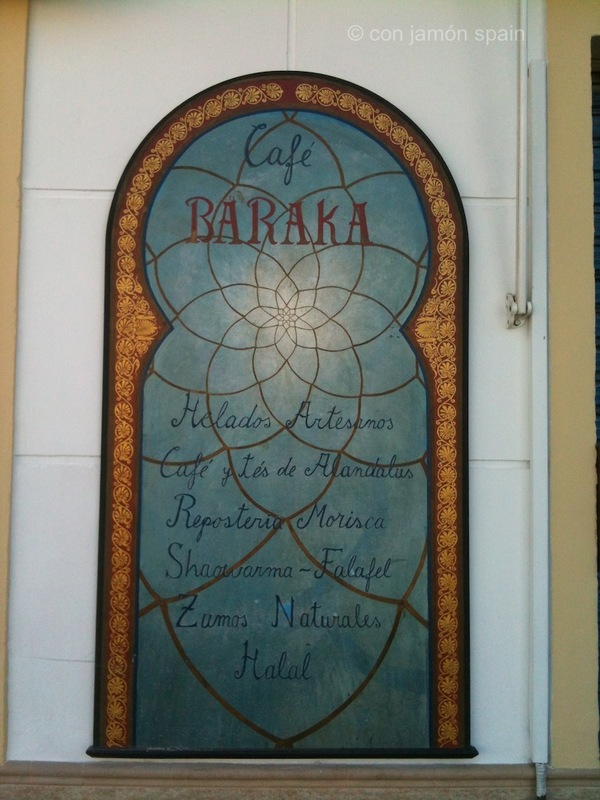 There’s nothing in Órgiva like Baraka (‘blessing’) – it’s easy to imagine you’re in North Africa. If you can pull yourself away from the traditional bars in town, this café/restaurant offers a completely different experience. A bit of variety doesn’t hurt once in a while. It’s a favoured meeting place for hippies – and a fair amount of people who, quite possibly, live in Oxford and listen to Radio 4. Worry not, it’s a gem and you go for the food. It’s simple, freshly-prepared and delicious – plus it’s all organic, if that’s important to you. While (halal) meat dishes – like beef couscous (€14) – are available, it’s arguably the best place in town if you’re a vegetarian. The salads, scattered with seeds and pistachio nuts, are wonderful and the Guacamole (€9) and Baba ghanoush (mashed baked aubergine, garlic, spices and lemon juice), again, €9, are worth visiting Baraka for alone. We normally have a falafel Showarma wrap (€5) which is more than enough for lunch. We did try the menú del día (€14.50) which included a ‘never-had-this-before’ thrill of a garlic and almond gazpacho. This was followed by a simple Tajin de pollo (chicken tagine) at €14.50 if ordered as a ‘normal’ and separate dish – which was so nice we nearly ordered another. Finally, slightly incongruously perhaps, a tiramisu. 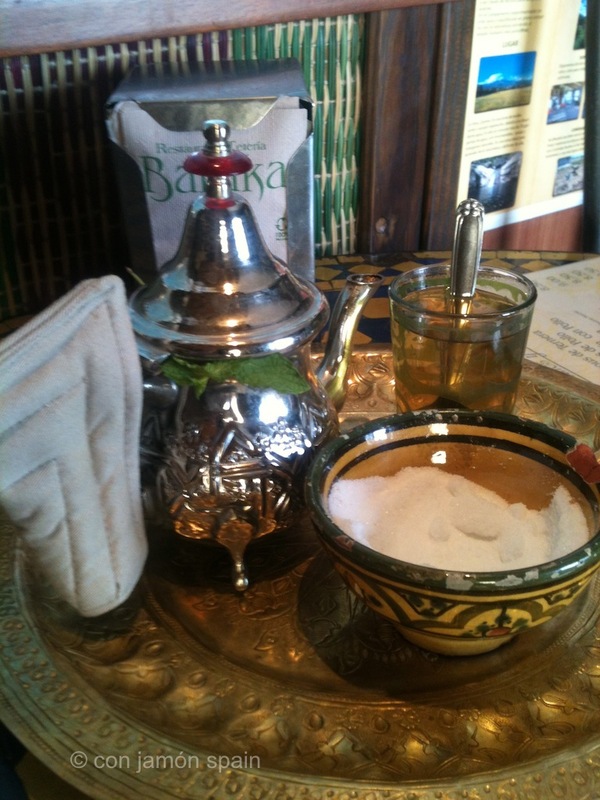 In fact, Baraka is big on sweet things: homemade ice cream (May to October), cakes and baklava – as well as swirling, rich hot chocolate. There’s internet (not Wi-fi, you plug in – Baraka’s location on this map)), clean loos, a shower (€3.50), newspapers (including the International Herald Tribune and an English version of El País) and a small selection of stuff for sale – like soaps and local honey. There’s a bookshelf containing nature books and both the Koran and the Bible – hey, this is today, we all love each other! The interior is cool, dark with low-slung seats – ideal for a bit of surfing. There are tables outside too which are hard to get hold of on market day (Thursday) when people descend on Órgiva and swell its population. If you want to guzzle a beer or enjoy a glass of wine, forget it, it’s dry. No worries, a freshly-made lemonade (€3), fresh fruit/veg juice with ginger (€6) or mint tea come to the rescue – and you can always depart for the nearest bar afterwards! It’s almost impossible to fault Baraka. Go, you won’t be disappointed. Baraka: Calle Estación, 12, Órgiva. Open everyday 12pm to 11pm except Thursday, 9.30am to 4.30pm.